AtmoPy is a tool for data processing and visualization in atmospheric sciences. It is part of the Polyphemus system, although it can be used independently. AtmoPy is based on Python 2.3 and higher. The latest version of AtmoPy is version 1.7, released on 2009-05-18. 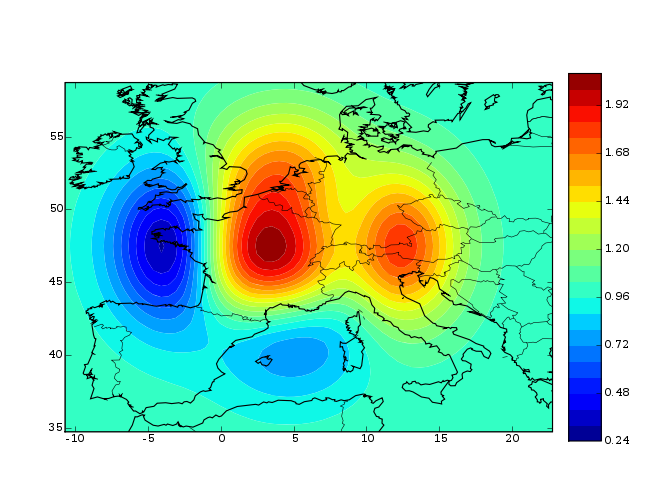 AtmoPy relies on functionalities of Matplotlib , a plotting library with a syntax similar to the one of Matlab, and in particular its module Basemap. Make sure to download it. A documentation for AtmoPy has been generated using Epydoc. You are invited to browse it online. Added the class 'Source' with the related functions 'read_sources', 'get_sources_coordinates', 'get_species_sources_coordinates' and 'get_level_sources_coordinates' to display point sources. Added functions 'fac2', 'fac5', 'nmse_1', 'mg', 'vg' and 'fmt'. Also renamed 'nmse' to 'rnmse_2'. Added the ability to penalize the 2-norm of the weight vector in 'ELS' and 'ELSd'. Added the normalized mean square error (NMSE). Improved the support of the default string format in 'Station': the latitude, the longitude and the altitude of the station may now be missing. Took into account an API change that occurred in Matplotlib so that Matplotlib 0.98.x may be supported. 'segplot', 'segplot_logx' and 'segplot_date' raised an exception whatever their arguments may be. For some locations outside the domain, 'get_simulated_at_location' raised an exception (because of indices out of range) instead of returning an empty array. Added the learning methods 'ExponentiatedGradientAdaptive', 'RidgeRegressionDiscounted', 'RidgeRegressionWindow', 'Polynomial', 'PolynomialGradient', 'FixedShare', 'FixedShareGradient', 'VariableShareGradient', 'OnlineNewtonStep', 'InternalZink', 'InternalPolynomialGradient', 'InternalExponentiatedGradientDiscounted' and 'DynamicLinearRegression'. In ensemble methods, added support for per-station predictions, for hourly predictions and for learning with extended weights. Added bias removal in 'EnsembleMean' and 'EnsembleMedian'. Added 'EnsembleData.AddSimulation', 'EnsembleData.ComputeStationStatistics', 'EnsembleData.DuplicateEnsemble' and 'EnsembleData.RankArray'. Added the keyword argument 'states' to 'disp' and 'dispcf', so that these functions may display the state boundaries. Added the options 'open_figure', 'resolution' and 'area_thresh' to the function 'getm'. Improved 'w_least_squares' to deal with few observations. Added a makefile and a SConstruct file to compile "extract_configuration.cpp". Added an error message if the configuration file for visualization is not found. Improved 'compute_stat_step' so that the keyword argument 'period' may be a list of datetime. In 'ELSd', 'ELSdN' and 'BestModelStep', a complete lack of observations could not be handled at the first aggregation step. This bug resulted in raising an exception. Fixed a bug in 'get_daily_obs_peaks' and 'get_daily_peaks': the keyword argument 'nb_range_min' was not properly handled and it was de facto lower than 2. This bug has slight consequences: the only AtmoPy code using this function is in 'EnsembleData'. This class has been slightly modified so that the results remain the same as previously.